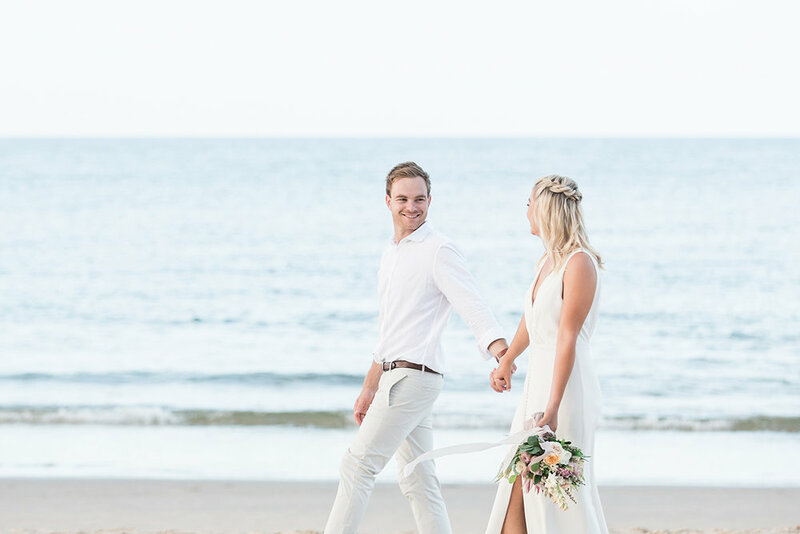 I was thrilled to be tagged in these beautiful photographs of our real bride Jess by White Images on Instagram, who captured Jess + Justin's day earlier this month. 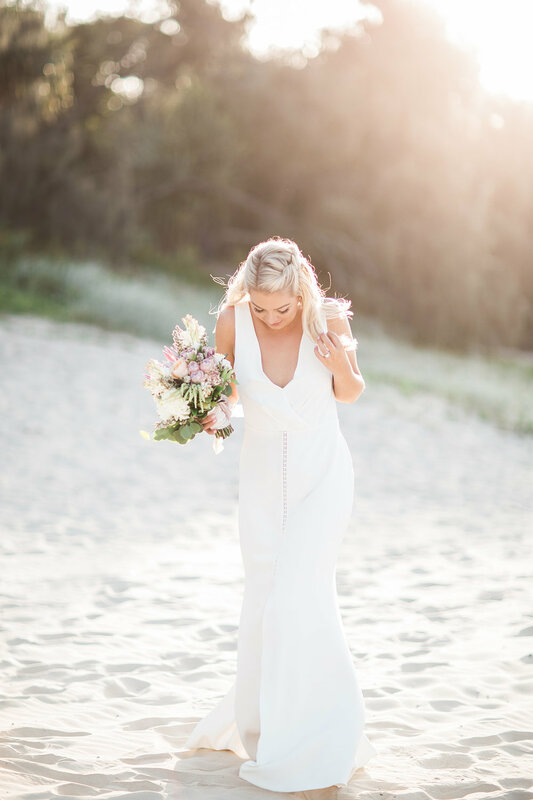 Jess looks absolutely stunning in her Arielle wedding gown which she purchased through The Bridal Atelier in Melbourne. What was your wedding venue (ceremony & reception) and why did you choose there? We ‘eloped’ with our close families. 12 guests all up. 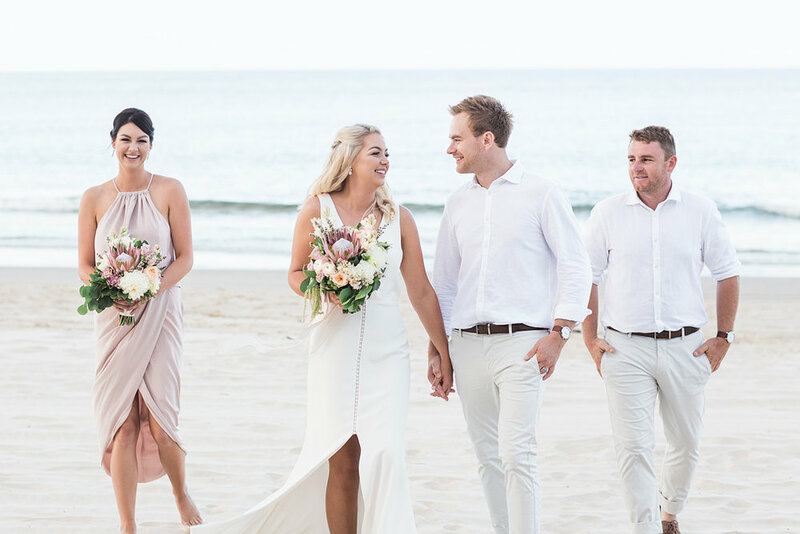 The ceremony was at Maison La Plague in Noosa Heads and we then got a water taxi to take us to Ricky’s Restaurant on the Noosa River. What is your proposal story? I had been dropping not so subtle hints about the sort of engagement ring I wanted. We had been together 6 years and lived together the whole time at this stage so I was wondering when he would be ready to pop the question. He surprised me on Anzac day long weekend at a local park with the most stunning ring! We met up with friends afterwards for drinks to celebrate. How did you hear about Prea James Bridal? I randomly found Prea James Bridal on Instagram. As soon as I saw the Arielle Dress I fell in love and knew it was the one before I had even tried it on! It was exactly what I was looking for. What do you love most about the gown? I love the simplicity in that it isn’t a traditional lace wedding gown. The cut of the wedding dress with the blousy top and low back is so flattering on and it is one of the comfiest dresses I’ve ever worn. The fabric is so soft. Are there any special details about your wedding that you would like to share? 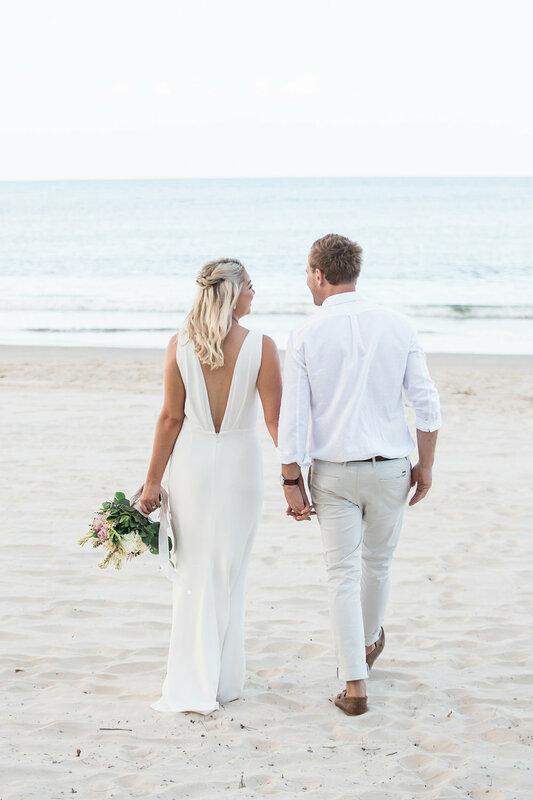 We got married in Noosa as we went for a getaway after we got engaged and fell in love with it. We have been back 4 times since the engagement getaway and it is like our second home. We ‘eloped’ with just our close families so it was a intimate ceremony and we are so glad we did it this way. It was relaxed, stress free and so much fun! Finally, Do you have any words of wisdom for couples planning their big day? Relax and enjoy the process. Don’t dwell on tiny details or overthink your choices, make a decision and stick with it. I found writing a list of everything I needed to get done so handy and ticking them off one by one was satisfying. Also- Enjoy the day! It goes so quickly, especially the morning while you are getting ready so my suggestion is so have a drink, a cheese platter and put on your favourite tunes with your bridesmaids and just relax and soak it all up! Chloe was amazing! Her attention to detail is fantastic and she makes sure she gets the perfect shot. Both amazing girls who made sure everything was perfect- especially Sam from Si Organics! She went above and beyond to make sure our hair was perfect. Hannah was such a lovely down to earth girl who made the makeup application a fun experience. She was easy to chat to and have a joke with. Jo was fantastic! She made sure I got exactly what I wanted, even researching and buying new pots to put the florals in to match my theme at the restaurant and hotel. Can’t thank her enough.